Last night saw the culmination of all the hard work by the ‘A Toothbrush Tale’ team – with the final dress rehearsal at the Newtown Theatre being staged. 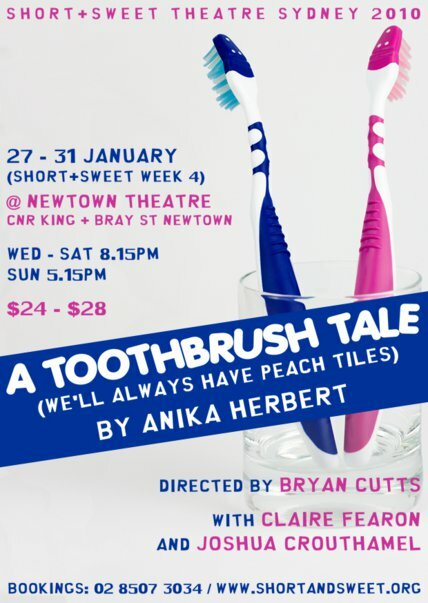 The short play by Anika Herbert, starring Claire Fearon and Joshua Crouthamel – and directed by Bryan for Short and Sweet Theatre Sydney – is a cute little story of Toothbrush love, personal discovery and uncalled-for “minty freshness” being forcefully imposed. The rehearsal was delightful, indicating a terrific performance will be presented to the Short and Sweet audiences who crowd into the Newtown Theatre. The closed rehearsal was seen by industry people and other S&S participants, and the feedback about our toothbrushes was wonderful to hear. “Delightful”, “cute”, “sad” and “funny” were the words used by several people who spoke to Bryan after the rehearsal. So NOW is the time to book your tickets and check out the smorgasbord of 11 short plays which makes up the S&S programme at the Newtown Theatre from tonight, Wednesday 27th January, until Sunday 31st.